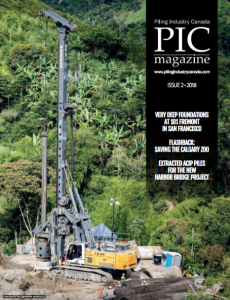 Pile Dynamics has recently announced the release of a new model of Pile Driving Analyzer® (PDA) System, the PDA-8G, billing it as the culmination of a complete redesign effort of the most widely employed system for Dynamic Load Tests of any type of deep foundation. Like previous PDAs, this 8th generation model performs the test normalized by the American Society of Testing and Materials standard ASTM D4945. The test, which for many decades has been accepted as an alternative for static load tests in more than 100 countries around the world, takes place either during pile driving or when a substantial mass impacts a non-driven pile. At each impact the Pile Driving Analyzer takes data obtained by sensors attached to the pile and calculates bearing capacity and other quantities. In the new PDA-8G these quantities number more than 230: a trove of information to the geotechnical engineer, who doesn’t even need to be at the job site. With this new model Pile Dynamics made its SiteLink® technology easier to use. SiteLink transmits test data in real time from the field to an office computer at an alternate location. The majority of engineers will probably still use the PDA-8G in the field, however. For them, Pile Dynamics made a tablet-like PDA that is thinner than previous models, light, ergonomic, and with a high visibility touch screen display that responds to gesture controls like swiping and pinch-to-zoom. The PDA-8G is being offered with either four or eight universal channels of data acquisition, all compatible with both cabled and wireless sensors. This enhancement from previous models is of particular interest to those who test large diameter shafts. Data transfer from the sensors to the PDA is extremely fast, suitable to test piles driven with high blow rate hydraulic hammers. The PDA-S software includes extensive data input help and output customization, and two real time capacity calculation methods (CASE and iCAP®, which is similar to the well-respected CAPWAP® software). Incidentally, a new version of the CAPWAP data analysis software is also being released. All PDA systems include licenses of CAPWAP, of the GRLWEAP Wave Equation Analysis software and of the complete PDA software suite. Pile Dynamics offers a host of other systems for quality assurance of deep foundation in addition to the Pile Driving Analyzer. For more information on the PDA-8G visit www.pile.com/PDA.